Summary: This project will continue the restoration of loggerhead sea turtle nesting habitat on Elliott Key by removing exotic invasive beach naupaka from two nesting beaches (Tannehill Beach and Adele Beach) prior to the onset of the nesting season, and by maintaining all eight partially-restored nesting beaches through removal of accrued marine debris during the nesting season. On six different project days during the non-nesting season (between November 2013 and March 2014), volunteers will be transported to Elliott Key via BNP vessels, and using loppers, clippers, and shovels, will manually remove beach naupaka shrubs from the coastal dune area of Tannehill Beach and Adele Beach. In addition, as part of a plan to maintain the efforts of STC-funded Project #12-003C, on eight different days, volunteers will be transported to Elliott Key and will manually remove any recently-accrued marine debris from all eight partially-restored loggerhead sea turtle nesting beaches during the 2013 sea turtle nesting season (May to September 2013). Results: Phase II of this project was a continuation of a marine debris removal project funded by the Sea Turtle Conservancy (STC # 12-003C) in which 229 volunteers donating 1,815 hours removed 5.2 tons of debris from the sea turtle nesting beaches of Elliott Key, FL. 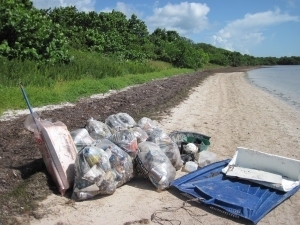 At the beginning of loggerhead sea turtle nesting season, between May 1 - June 30, 2013, volunteers were transported to Elliott Key where they manually removed an additional 1,122 pounds (.56 tons) of marine debris from eight partially-restored loggerhead sea turtle nesting beaches. A total of21 volunteers donated 126 volunteer-hours toward this effort. The Scaevola sericea (beach naupaka) removal portion of the project took place between December 2013 and April 2014. On six different days, volunteers were transported to Elliott Key via BNP vessels, and using loppers, clippers, and shovels, manually removed beach naupaka shrubs from the coastal dune areas of the two longest nesting beaches, Tannehill and Adele. BNP volunteer sea turtle monitors observed and recorded loggerhead sea turtle nesting activities, including false crawls, nests dug, and predation for both the 2013 and 2014 nesting seasons. The results are shown in Table 2. In addition to observing an increase in the loggerhead sea turtle nesting activity, in 2013, BNP resource managers observed and recorded a green sea turtle (Chelonia mydas) nest for the first time since nesting data on Elliott Key has been collected.